Fast food remains top of the menu at major tourist attractions across the country, a report has found. A "secret mum", who visited 14 top attractions for the Soil Association, found most sites were failing to provide healthy food and drink choices. The Eden Project and the Tower of London were the healthiest, serving fresh fruit and drinking water. New MetroLand in Gateshead and Camelot Theme Park in Chorley, Lancs, were named as the two worst offenders. The researcher found no fruit for sale and a "woeful lack" of healthy food and drink on the day she visited them, according to the organic campaign group's Taking Our Children for a Ride report. It took the researcher at least an hour to find any fresh fruit at eight of the 14 venues she visited in England and Wales. "In general, we found that hot dogs, burgers and chips still dominate the choice on offer," the report says. "It is also difficult to find a portion of vegetables if you don't care for mushy peas." A maximum of 25 points were awarded for the availability of fresh drinking water, healthy drinks in vending machines, healthy drinks excluding water, fresh fruit on site, children's meals, and food promotions. 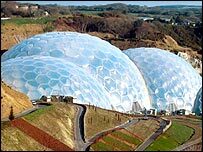 Only the Eden Project in Cornwall and the Tower of London scored above half marks. The Soil Association's policy director, Peter Melchett, said child-centred venues had a responsibility to offer alternatives to junk food. "Not to provide kids with the option of free water on a day out is scandalous," he said. "It is crazy not even bothering to offer fresh fruit or the choice of a healthy meal for children." The report's findings are based on single visits to each attraction carried out in late June and early July. The report was compiled in partnership with children's food company Organix.